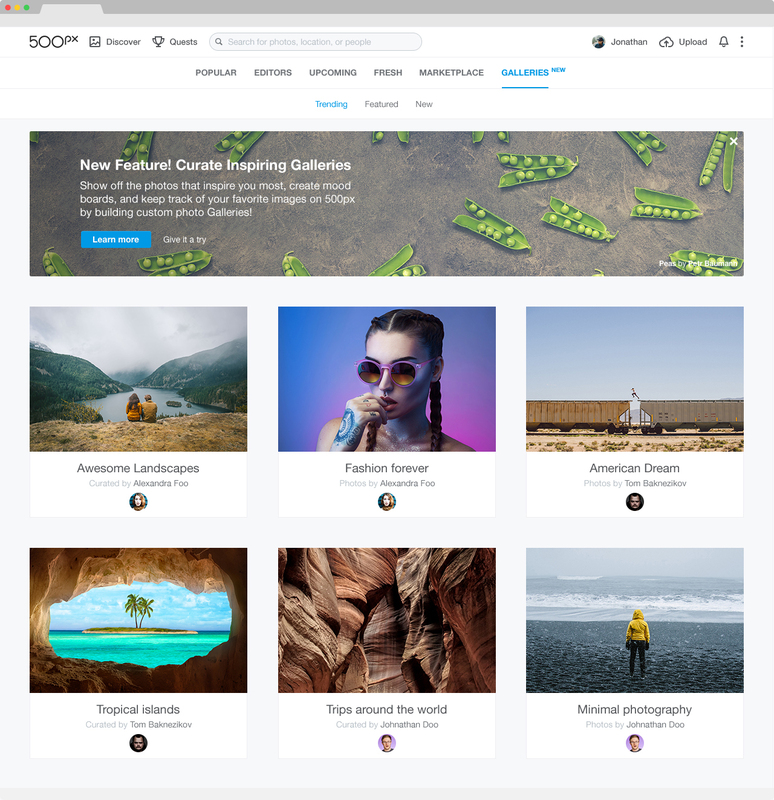 Users had multiple ways of interacting with the 500px Community’s content. Most frequently though, the majority of comments, shares and likes, were given to recently uploaded photos. This behaviour was caused by the time-sensitive, back-end algorithms constantly surfacing new content on platform’s most viewed pages. As a result, the site always displayed high-quality, fresh new photos to the users but, many of these photos ended up buried and virtually hidden forever after their brief spike of visibility. This impacted negatively the user engagement towards a Community that seemed to prefer merely new photos. 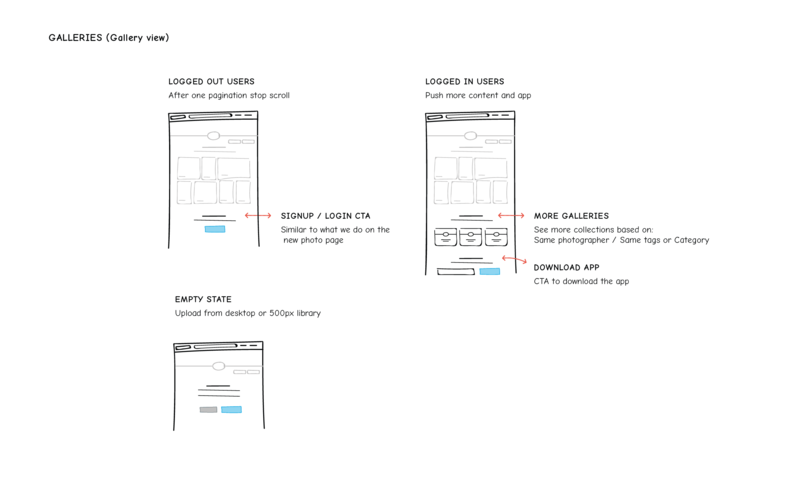 Galleries is a fully responsive feature. It looks gorgeous on both Mobile and Desktop. The key objectives of this project were mainly: increase the engagement of non-contributors and create a re-engagement loop for existing users. 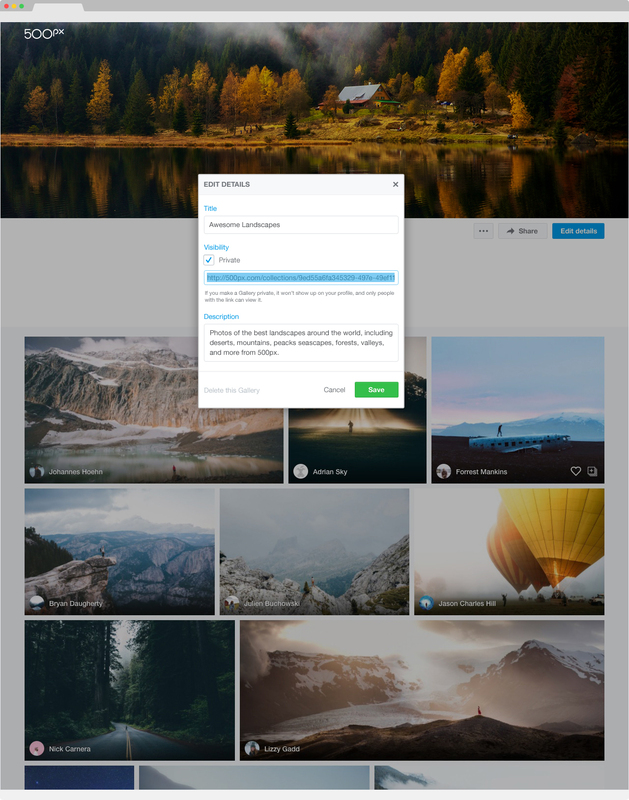 Extend the discoverability of older photos, surfacing them in front of the community long after their upload date. In order to find the best approach to re-surface old content on the site, I needed to know the type of users who were using the platform. The question was: “Who is using the community and for what purpose?” I gathered some information and formalized these findings into specific personas to help drive and support a specific design strategy. The team and I did lots of user interviews and focus groups during the year preceding this project. 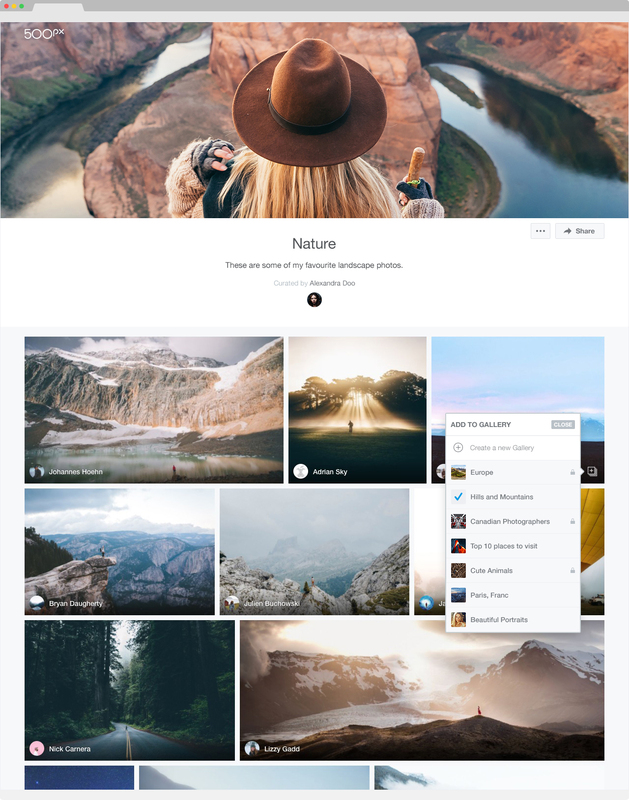 We were working on the 500px Marketplace MVP (formerly known as project Prime). The goal for this initial phase was to retrieve and structure the information gathered in previous projects and understand how to leverage it for the upcoming challenge. I used different approaches over time to refine our personas. Through user surveys and focus groups, I was able to define three distinct user categories. Buyers, Pro Photographers, Photo Enthusiasts. This helped me understand that different users were using the platform for different purposes – but that somehow, there was also an overlap. Everyone was leveraging different existing features to achieve one specific goal – grouping photos in predetermined buckets. The intersection between persona's goals on the 500px community. Buyers were using the cart to collect and keep track of possible future purchases. Pro Photographers were curating and re-ordering images on their public profile to reflect their style or most relevant projects. Photo Enthusiasts were liking and sharing photos in order to demonstrate their curatorial skills on other platforms and to gain personal recognition. 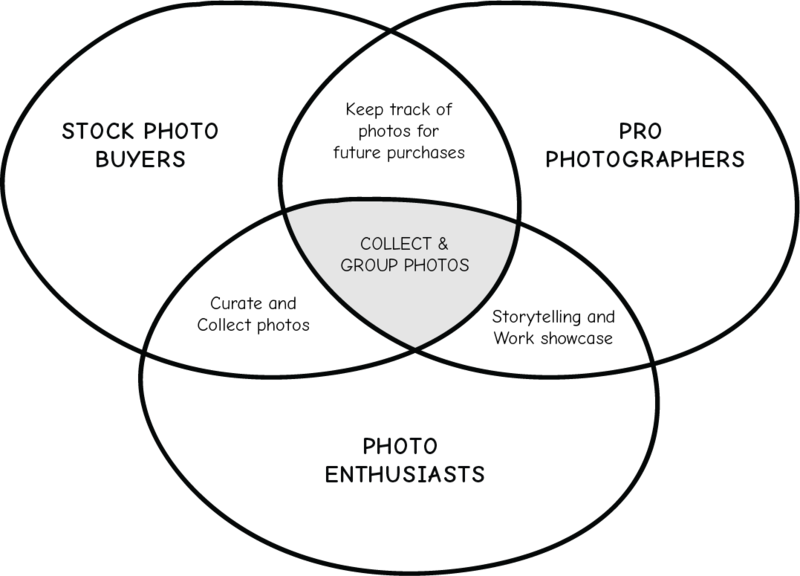 I proposed to leverage this task overlap by building a unique feature that enabled users to seamlessly collect photos and then to share the entire curated group. 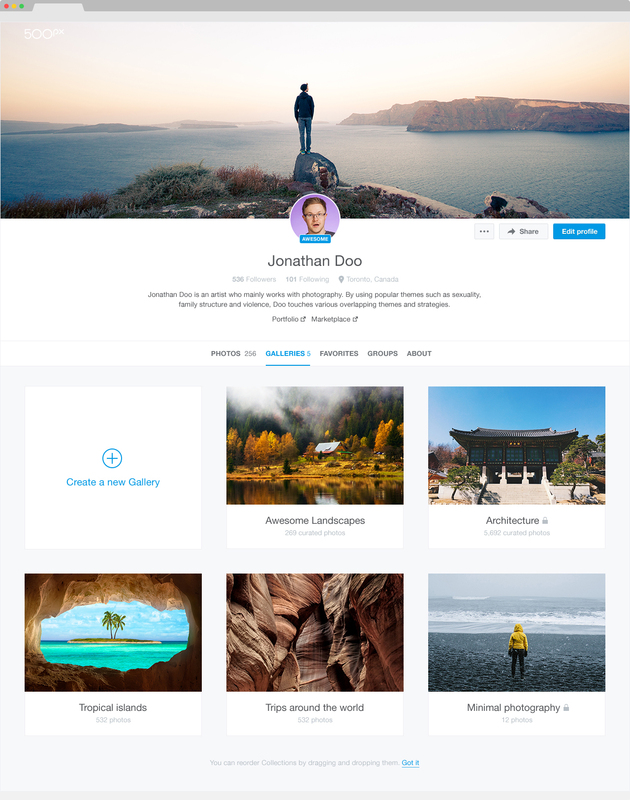 Every photo would be handpicked by a user and placed in a specific curated collection. As a result, every time a photo was grouped with others, the system triggered a feedback loop of push notifications and emails, to notify every photographer that their content was found and collected by another member of the community. 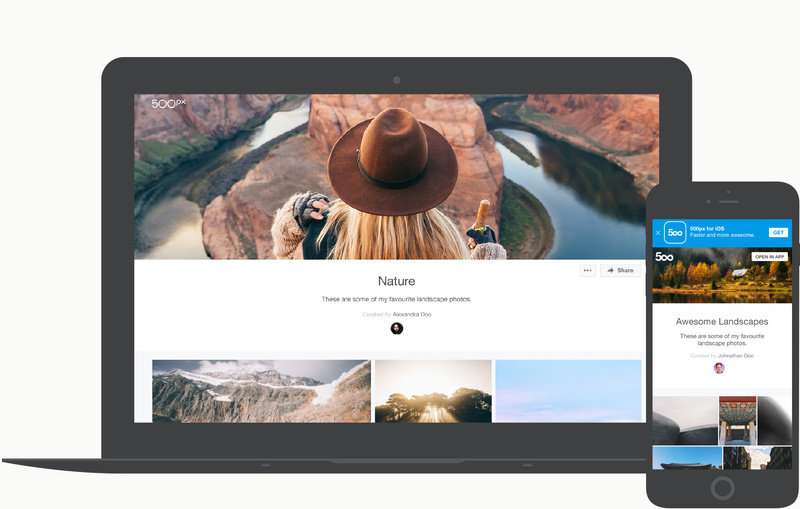 We named this feature 500px Galleries. 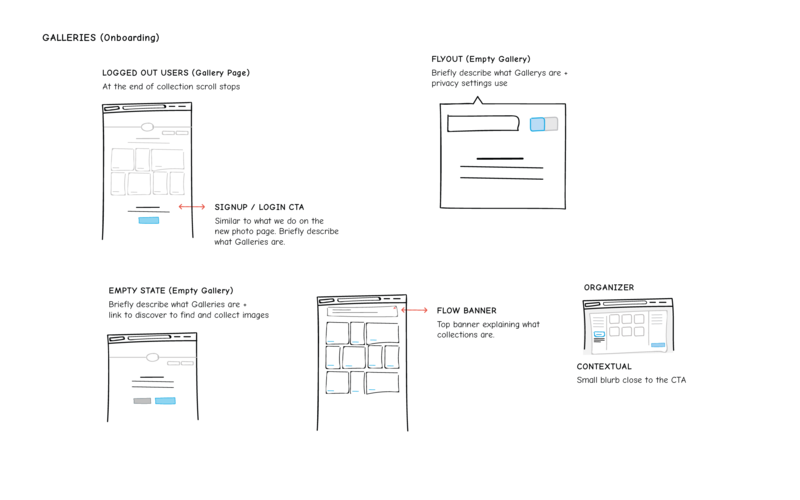 Some of the sketches designed to illustrate the strategy to the entire product team. Title, Description and Cover Photo in order to create a context to help storytelling. 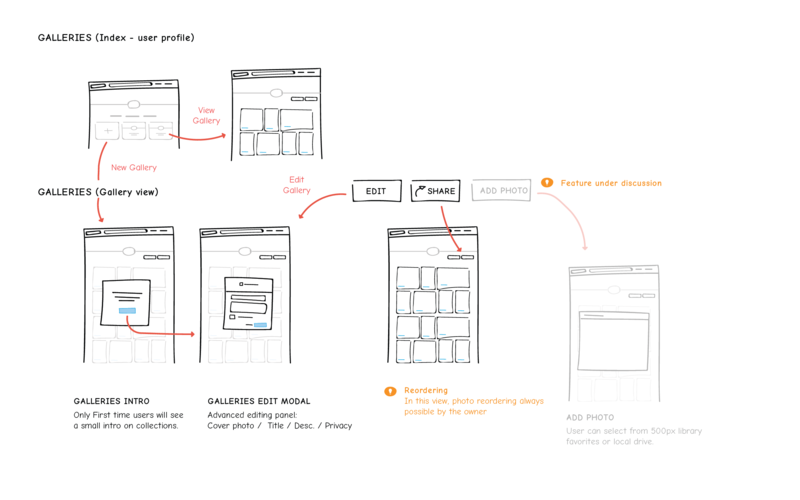 Flexible privacy settings to preserve people’s privacy in case users wanted the collection to be anonymous – to serve the buyer use case. A photo re-ordering interaction that helped curators and photographers create a proper narrative with the selected photos. Particular attention was also given to the logged out experience and logged in personalization and onboarding. Signup Call to action for logged in users and informational empty states were specifically designed to increase conversion rate and to educate the users on how to use this new feature. Different users were using the platform for different purposes – but that somehow, there was an overlap. 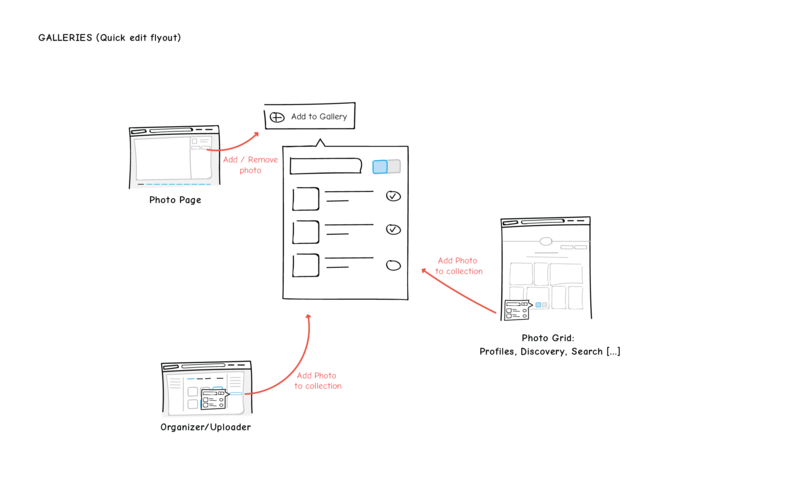 Everyone was leveraging existing features to achieve one specific goal – grouping photos in predetermined buckets. Mobile view of galleries for logged out users. With tailored content to download the native app. A single gallery in edit mode. Some of the UI mockups and different views I've created for this project. Galleries created that missing re-engagement loop, bringing inactive users back to the community by re-engaging them when one of their old photos was collected. The feature, was simultaneously released to the community for Web, iOS and Android with a great effort from multiple teams. It has been one of the major user facing features released on the Community side and in just seven days, the feature generated a 13% increase in photos uploaded to the community and a 20% increase in engagement both for mobile and web.